Product code: ES6211 Categories: Sold Items, Sold Rings. 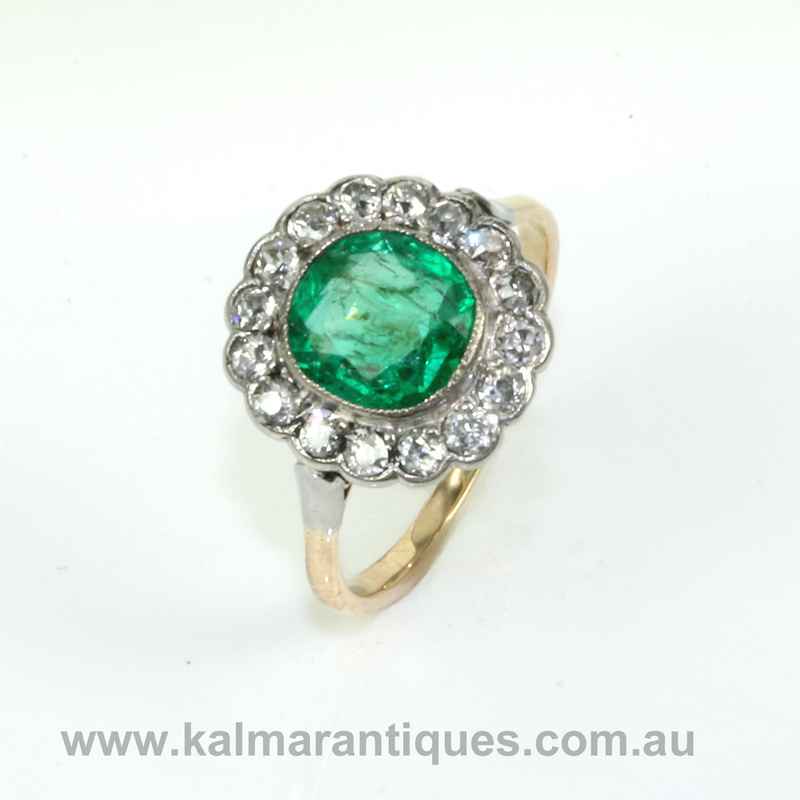 Colombian emeralds have long been regarded as the best in the world and here is a magnificent Colombian emerald and diamond cluster ring dating from the romantic Art Deco period of the 1920’s. Hand made in 18ct yellow gold and platinum, the setting of the ring is so elegant and looks spectacular on the finger. In the centre surrounded by the diamonds is a truly magnificent natural Colombian emerald that measures 1.60 carats in weight. The fine green colour and great transparency just show why Colombian emeralds are so highly regarded the world over. With a perfect green colour, this is only accentuated even further by the 16 diamonds that surround the emerald. These diamonds total 0.48 carats and really do enhance this ring without taking away from the beauty of the emerald. Measuring 28.3mm from left to right by 28.5mm, the size is perfect to wear all the time with pride. 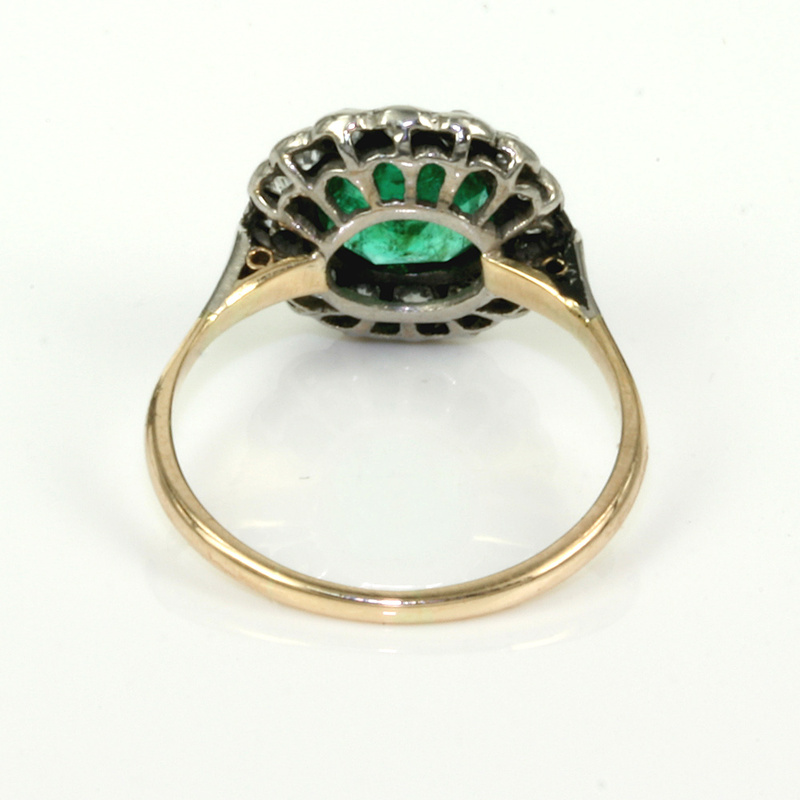 Art Deco rings are always so sought after and popular, and combine this with a natural Colombian emerald then you really do have a winning combination that will always look so good.